The way my desk is positioned means that when I’m on my computer I face the corner of the room, which means the door is behind me. Quite often I’ll stay up late working away till early hours of the morning and usually music comes hand-in-hand with coding (for me anyway), so when it’s late, I use headphones so I don’t disturb anyone else. This has caused me some grief as sometimes someone will come into my room for whatever reason and find me with my back to the them and headphones in, so knocking at the door or saying my name does not get my attention. This leaves the last resort of tapping me on the shoulder which scares the crap out of me! 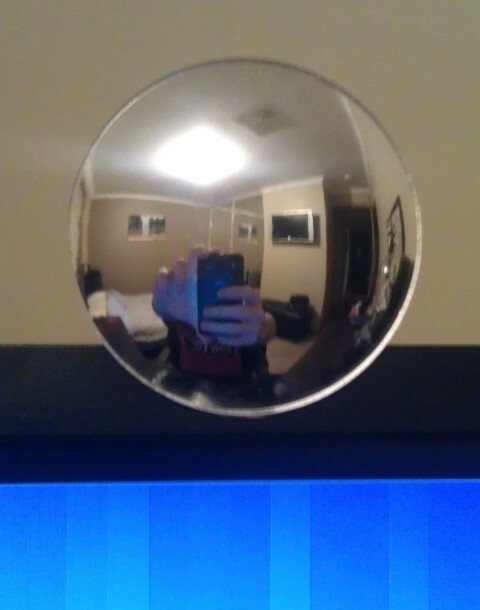 A while ago I invested in a convex mirror designed to go on your computer screen so you can see who’s coming up from behind. Well, with a 24-inch screen and deep concentration, this small mirror doesn’t catch me eye at all, so I still hit the ceiling when someone taps me on the shoulder. For my birthday I got this amazing Astro A40 headset. Sound clarity is absolutely stunning, they are really comfortable to wear and they block out a lot of surrounding background noise. While I absolutely love the headset and wear it all the time, you can probably guess this adds to my jumpy-ness! So I finally found a solution! There is a package in the Ubuntu repositories called ”motion” - which is a really simple motion detection server that utilises a webcam. I had a look at ”zoneminder” too, but it seems very over-kill for my needs. motion will detect movement (above a configurable threshold), store “movement” snapshots and video files, log to a database and more importantly it provides a few hooks to fire commands upon events such as on_event_start, on_motion_detected, etc. I disabled almost every option except the on_event_start hook. This hook will execute the given command when motion has been detected after a (configurable) “gap” period of time of no motion - which I set to 10 seconds. Note: the –hint=int:transient:1 is for Gnome-Shell which has introduced persistent notifcations and I didn’t want to acknowledge a notification everytime someone walks past! The reason I am using sudo here is that motion needs to be run as root, and so the notify-send command will also be run as root. 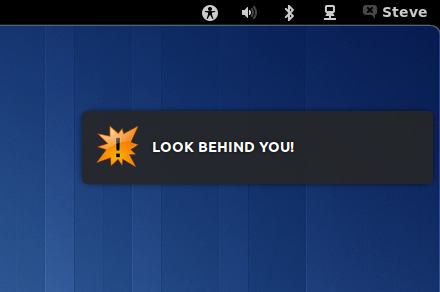 I guess because I had Unity installed before Gnome-Shell, when root runs notify-send, I get the Unity style notifications - which is still nice, but as I’m road testing Gnome-Shell, I figured I may as well use its notification look-n-feel too.